Recently people have been posting photos of things that they’ve done because of something I shared on The Whole Bag of Chips. My husband had the idea to share those photos on my blog as well, so I thought I’d create a Photos from Fans page, a “photo album” of sorts. If you’d like to share a photo of something you’ve done or made as a result of reading this blog, you can email it to me at jenniferlcowart@gmail.com. Kim split the Pumpkin Cranberry Bread batter in half, making one bread with chocolate chips and one with nuts. Cathy made the Pilgrim Pies for Thanksgiving. Cathy also made the first Your Tray or Mine recipe for Chocolate Thumbprints. I loved Kim’s version of the Turkey Pot Pie using her Thanksgiving Leftovers! I love creative people…Pam used holiday cookie cutters to make the top of her Raspberry Squares! Thanks to Sabrina J. for saving the day and sending me her Cinnamon Applesauce Ornament photos! They’re in the blog post as well. Happy Hanukkah to the Clough family who used the brisket recipe for their Hanukkah meal! The Clough Family had Easter Sweet Bread this year too! 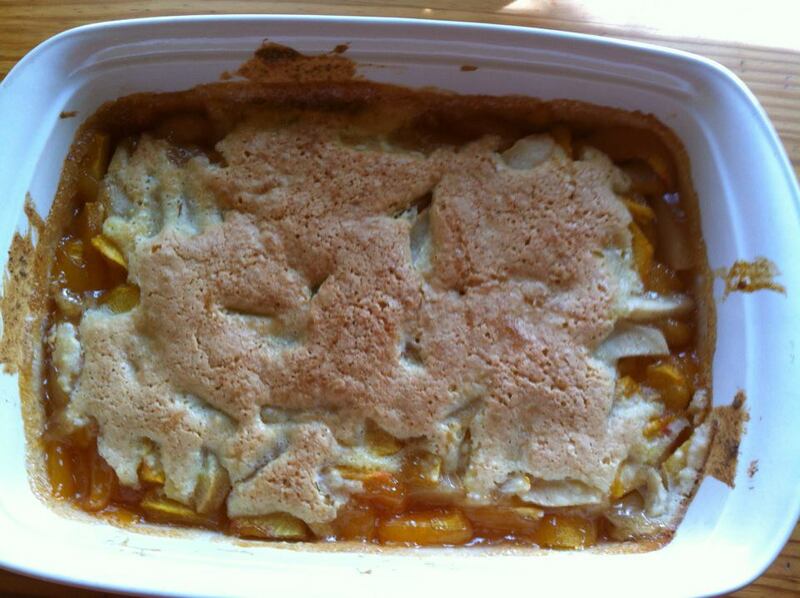 Thanks to the Sosa family for sharing their picture of Grandma Willis’ Peach Cobbler!